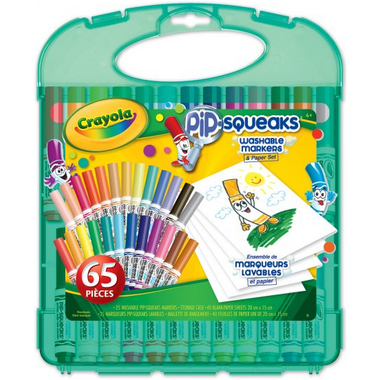 Pip-Squeaks Markers are small in size but BIG in colour. The easy-to-hold short barrels are fun and fanciful and include Crayola’s special washable ink. This cute and colourful collection of Crayola Pip-Squeaks Markers and paper includes 65 pieces in a durable, portable carryall case! These markers are the perfect size for my toddler and she loves that it comes with a case. Paper was just an added bonus!